Oh Y'all - I am worn out tonight. It doesn't help that I feel like I'm getting sick again. What is the deal???? In 15 years of working - I don't think I missed more than 5 days total for being sick. I've just always been so healthy but I feel like I'm constantly sick this year. Did having a baby kill my immune system? Anyway - this morning I went to Bible Study at my church. Once a month our women's group leaves Bible Study early and we go to visit shut ins or members of the church who are now in nursing homes or assisted living. This is RIGHT up my alley because I love old women and I love nursing homes. So Laurie and my friend Amanda and I went to visit Irma in an assisted living. She was very sweet. We picked up our girls and went to eat at one of my favorite places - Shogun Express. It was so good! I wish I would have taken out my camera this morning and taken a few pictures but I didn't. We came home and Harper had no desire for a nap. So I let her play in her room and I re-organized her closet. I packed up all of her clothes that no longer fit in a big tub and went through all of her stuff to make sure we don't miss any outfits! I was glad to get that taken care of. At least for a few more months. Laurie had to take Sarah Kate to the doctor so I kept Emily for a few hours. She is SO much fun and Harper really liked watching a "big girl". 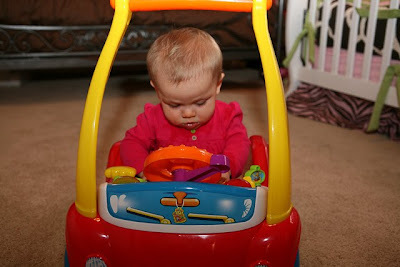 We ate snacks and Harper played in her new car toy. 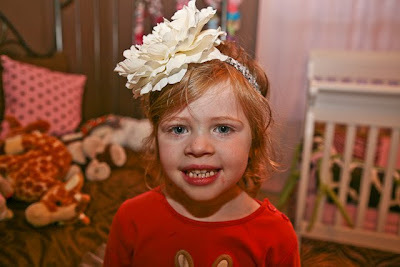 Emily played with Harper's stuffed animals and dressed up in her tutus and flower bands. I thought she looked SO cute in this big flower. The two of them got in Harper's bed and played for a little bit. We had a great time and I filled Emily up with every sugary snack we had in our house so I'm sure she will be bouncing off the walls all night (sorry Laurie!) I'm thinking she had fun with us because when Laurie came - she ended up having to pick her up and carry her out while she screamed all the way to the car "No - I don't want to leave. I don't want to go home!". I'm not going to lie - that tickled me to death! The second child will rock your world and by the third things are so hectic you hardly notice any difference! :) I love ALL 3 of my daughters but it does make for a crazy and busy life. And I wouldn't trade it for a thing! It isn't easy, but SOOOOOO worth it! I love having two girls. 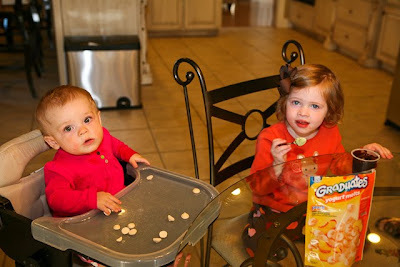 I have a Sarah Gray (16 months) and Mary Anne (just turned 5). That gap in their ages has been great for us! It's hard but totally worth it! I don't think I've slept all night through in 2 1/2 years! I have a daughter turning 2 on Saturday and an 8 month old son. I'm very thankful for the help of my parents that live close by! It is tiring, hectic, crazy, wonderful, fun, and totally worth it. I have 2 little girls (18 months and 3 months). The first was so good and easy, we just couldn't wait for another. Wow! Did this second baby girl rock our world?!? But I wouldn't trade it for anything in the world. Every day that I read your blog, I secretly hope it is the day that you announce Harper is going to be a big sister. I say go for it! I don't have kids, but I do have faith that you can definitely handle an other one:) And...Harper needs a playmate!! She can help you train the next one up! Ha!! Having 2 is so much fun. I have 2 girls and they just love having a sister to play with (well, most of the time). What editing software do you use for some of your pics? I have PhotoShop Elements, but I'm not real sure how to play with it. Enjoy your baby - she is precious and it will go by so fast. I wouldn't say easy :) but totally worth it! I have two little girls, and two quickly became my new "normal" after my second was born. God equips you to take care of them, even when you're exhausted! You just have to do what's right for your family -- 1..2...15...it'll work out great! I have two sons that are 23 months apart and I would change a thing! They are 8 & 10 years old now and so much fun. The first three months were hard but after that it was easy. Pretty sure it is lack of sleep that wrecks our immune system as moms...Keep drinking the H2O!! I only have one child, so I can't give advice on the 2 kids. But I can tell you that I have never been more sick in my life then after I had my daughter! I stay home with her, so it's not like she gets anything from daycare, but I feel like we always have colds, or coughs! Feel better soon! All of the pictures were so cute! Hey girl! I hope you're not getting sick. That's no fun! Take you (how's that for southern? ha!) some garlic and lots of vitamin C. They are great immune boosters! Have you heard of Emergen-C? It's a fizzy powder you put in water and it's a great source of Vit C. Hope you feel better soon! I am having our ninth any day now, in nine years might I add... and it is worth it ALL! Despite no sleep, no privacy, no showers some days, the list goes on, but I bet my "joy list" would beat it by miles. - Love your blogging ministry. It speaks to a tired mommy in Minnesota almost every day. :) Keep glorifying the Lord Kelly! Having two keeps them both occupied with each other. They have a play partner...I grew up in a family of 4 and loved it..we have 2 right now but want 4 more. :)! We LOVE kids and hope to have our own and also adopt...all the crazy busy stuff is well worth it! I laughed out loud at those pictures of cute Emily. My husband now knows of your blog as the one 'with the sweet little girl and her big bows!' :) I'm sure you'll find the energy whenever God is ready to bless you with another little one. Totally, absolutely, amazingly worth it! And if it makes you feel better....going from 0 to 1 was WAAAAYYYY harder than going from 1-2 (or 3). Go for it! Having two children has been the biggest blessing in my life. My kids are 3.5 years apart, and I wouldn't change a thing. It isn't easy... but defiantly manageable. Before my daughter was born I wasn't sure how we were going to do it... now I can't imagine our lives without her. I think God prepares you and your family for more children. I actually think having two kids is easier than one. My oldest daughter is in kindergarten and that leaves me three year old daughter to be entertained by me! I get waaaaay more done a day when I have them both home. It definetly takes some getting used to though! Sounds like a fun day! Hope you are not getting sick. I can't believe Harper has her first car! I thought the grandparents were going to get to buy her first car! What is that...a Ugo? We would have gotten her at least a Lexus!!! hee hee! Harper, Nonny and Papa love you and long to see you!! Kelly are you trying to tell us something??? Cos you are sick and you say" I packed up all of her clothes that no longer fit in a big tub and went through all of her stuff to make sure we don't miss any outfits! I was glad to get that taken care of. At least for a few more months." does that mean you might need to unpack it all again? And my sister in law started asking about going from one to two when she was pregnant again but not telling anyone yet. And I'm also an English teacher so I read waaaaaaay to much into things! I have two and love it. The first few months were a little crazy and we still have our crazy days, but I wouldn't trade it for anything. If my husband would have more I would have another one or two. Like you I rarely, if ever, missed work from being sick prekids, but after having kids I have gotten sick a lot more often. I never even got sick during my first pregnancy even though I was surrounded by sick people at work. It does get better, though, so hopefully you will get past this stage soon!! I'm really wanting to know how you get the pics to look like that last one you edited of the girls in the bed. It's such a cute effect! Share please! Girlie... the second child is such a change, but I promise in such a wonderful way! Yes, it's hard, but it's so worth every single minute!! I bet you're getting sick more b/c you're not around as many people on a daily basis as you used to be so your immune system isn't working hard, so it gets lazy! Ha. And I could never have kids-- it's too much work! Very cute pictures! I have a VERY important prayer request. Will you please visit my blog and just say a prayer for this family? Thanks. The great thing is that you have a best friend with kids around your kids' age that you can practice with before having more! Seriously it is good practice because once you get used to juggling and have another one of your own it'll be a piece of cake! I love playing/taking care of my friends' kids and I've really loved them helping me with mine. God gives us such a gift when we have people around us who love our kids! Kelly - i had 3 in 31/2 years! it was crazy- but i loved it...and loved every stage they grew threw - they are all and have always been each others best friends - they are now 26, 24, 23. Worth every sleep little night and all the invested time. Just imagine how much fun Harper is - multiplied. The additional children causes your love to grow in ways you did not know was possible. Sugar is really bad for the immune system- so when you have symptoms - cut the sugar and increase the vit c and water...in fact when i just took sugar out of my diet i saw my energy increase amazingly. there's nothing more precious than seeing your childrens love for each other. watching them play together, hold hands, take care of each other. sure you don't get as much sleep, and your house is messier, and you have less free time. but you gave up your independence by having one baby...why not have a few more!?! I have 3 and I feel like it's still not enough! Each child adds so much joy. 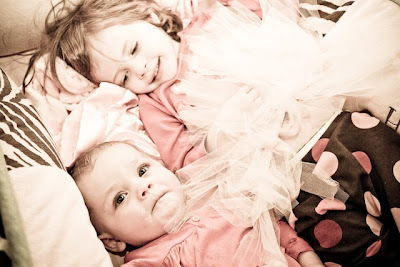 Kelly, I have 6 month old twin girls and it is SO much fun! They play with and entertain each other while I can get things done around the house! I think the same thing goes for most siblings (with the occasional argument I'm sure!) My girls fight over toys already! But it's fun and I wouldn't change a thing! If I were you, I would try and have them close together, it might be more exhausting at times, but they would be closer I think. I have 5 under 10,yes it is busy and hard but SOOOO worth it! My brother and sister in law have five. I seriously get tired when we are all together playing with the kids. ~Whew! I'm sure you just get used to it. Harper needs a brother or sister for sure! We just have Carter (13 months) right now, but are thinkging about number 2. My brotehr and I are close in age and very close in relationsip-way as a result. I imagine the early years being really hard, but I think that later they have each other to relate to and you get through the tough times all at once! Only God knows the ultimate plan though! For me, adding another on to the mix was a bit stressful at first, but my first born was a handful of a girl. After I got over the initial shock, it was easy peeze and adding the third and fourth were a piece of cake! You really get broken in easy because afterall a baby can't go anywhere or do anything at all, plus they usually sleep a lot. Harper needs a sibling one day. But the person who told my husband that 3 is no different than 2 is a LIAR LIAR PANTS ON FIRE!!! "Easy", as the mother of 4 that word no longer exist in my vocabulary, but so, so totally worth it! I have to agree with what a lot of the other mommies here have said, the second one was my hardest. Two sure did rock my world, but three, and four, not so much. I'm a fan of "the closer in age the better." So mine are really close together. Try to imagine double the amount of love you have for Harper, that's called a second child. Also, my children are so close. I love that they have each other to love! Another benefit is that you, your hubby, and Harper will all get opportunites to further develop your character. You know, patience, sacrifice, sharing, all the fun stuff that comes with another member of the family. And don't we all want to be more like Jesus! :) Ha! I'm sure that you and your hubby will prayerfully make the best decision for your family, but since you asked we say go for it!!!! I have three daughters and when their yours you dont even mind!! It's just what you do and you do!! So it's really not bad! Oh Kelly! Britt (my husband) says having kids is "like being tackled while playing football....once the first one has you down, it doesn't really matter how many pile on"!! Then he usually throws in "except that you have to buy them cars and pay for college!" Ever the philosopher, he is! But that is why we only have two! I don't think I ever told you that my husband is originally from AR too. As were his parents. They come from a little bitty town in South Arkansas called Hampton. It's a long way from you though. It's about an hour north of El Dorado (I bet you call it "El-duh-ray-duh" too! ha!I'm such a dork. I always called it "El-dor-ah-doh") We come out once a year when gun season opens for deer hunting! ha ha! It's crazy the love we have for our kids. If I could be a full time SAHM I would have another! I won't sit here and tell you two children are easy, but what in life IS easy? I have two little boys(18 months apart) and I wouldn't trade it for anything in this world! My boys are the BEST of friends, people who see them together say they pray their children will love each other as much as mine do! I love watching them play, laugh, and love each other and having them so close together has actually been easy on us! They can almost wear the same size clothes now and I cannot picture life any other way! I think Harper will make a great sister and you and scott will do just WONDERFUL when that time comes! You won't regret baby number too and God knows exactly what the timing is for that baby. I thank him everyday for BOTH my boys and I can just about cry thining how blessed I am and how my life is BEAUTIFUL chaos!!! Harper is getting so big! I know as a mom you have tons to stress about already, but I went straight to walking and I had arthritis in my back starting in my teens. My dr said my back never properly developed the flexibility crawling gives. Maybe talk to your ped? beautiful blog,I am looking forward to following. I am very new to all this and still finding my way around. Blessings from the Land of Oz. As a mommy to 4 boys, yes 4 boys it can be very trying.Everyone says after 3 you dont even notice, well I noticed ha! Our house is never quiet and always chaotic, but there is nothing better in the world than 4 mamas boys!! Going from none to one was hardest for me. Adding the second right after wasn't easy. The third, hmmmm, first time we were outnumbered. Four, Five, and Six - cake walk - as long as everything else in life is going right - and how often is that? Really, the more I've had, the more laid back I've become, and there in lies the key to the joy of motherhood. Whether you have one or ten, being a mommy is what you make it. Enjoy! I agree with everyone about the lack of sleep and just the different routine in general wreaking havoc on your immune system. I was really sick the year after I had Connor, and of course I have been sick the last week, too, after AK. I know God will guide you and Scott in whatever you decide about your family...He loves you both (and Harper!) so much! I love old people, too! What a wonderful ministry. I think it was the best 3 hours of her life. Bless you! Tonight when she prayed she said,"thank you that I go to Kelly's house and thank you Dawson not bite me." Thanks again for helping me out today. I LOVE the pics. I thought you were pregnant with all this sick talk, too! :) When I babysit my niece and nephew, it amazes me that anyone can work a full time job and even have one child. I am exhausted when it's all said and done! I'm baby sitting my friends 5 year old and 8 month old, tomorrow, after a long day of work on my feet. I hope I make it! i'm a pediatric physical therapist, and i just wanted to mention that, while every child is definitely different and prefers different modes of movement, it is SUPER SUPER important for babies to crawl!! so make that adorable girl practice all the time!! feel free to email me if you have any questions!! I love having 2! My son is 2 & daughter is 11 mos...20 mos apart. I'm contemplating a 3rd...but want to enjoy a summer NOT prego or breastfeeding. HA! Harper has GREAT taste in clothing. My daughter has the outfit she wore today and the green & brown carters one a few days ago! CuTE! You adjust to it, one child at a time. Before I had children, I thought that one child was exhausting. I now have 6 children, and five of them are active, busy, boys. :-) Don't give up the thought of more children. You are a great mom! I think early on more then one is hard, but as they get "older" or over 2, they need another one to play with - and it actually makes it easier. I have only one, I waited too long to try for number 2 and cant have any more. A playmate allows you to not have to be the only toy for your kiddo. It is so demanding when they only have you for attention day in and day out. Have another, and enjoy every moment of the craziness. Kelly - I have seven! (age 5 months - 11 years) And it's great -- seriously! I wouldn't trade my big family for anything. We started off thinking - "maybe two or three kids...", and then with each child that was born, it just made us want more! They are such a blessing and if you train them to obey your life is truly enjoyable. It's a joy to see your kids growing to love the Lord and each other and develop some precious relationships with each other that are irreplaceable! I thought #1 was hard b/c it was all so new. I thought #2 was hard well, because then there were two. I thought #3 was a little easier, she had two sisters with which to play. I thought #4 was a breeze ... he smiles at me and makes my day. I have 3 girls and LOVE, LOVE, LOVE every minute of it! I am always running from school, the dance studio, the gym, friends, shopping and any other place you can think of. I wouldn't have it any other way. After I had Sarah and could not get pregnant again, I knew that we would adopt. Now that we have 2 sweet angels from China I am so glad that Sarah has sisters--there is nothing better than a sister relationship! I have to say, number 2 girl wasn't nearly as hard as adding number 3! Finding the new "normal" took quite a bit longer with the 3rd one. Our family is now complete--3 boys and 3 girls--Twins, William and Thomas (20 years old at Georgia Tech), James 17 ( a high school senior), Sarah 11 (a new middle schooler), Grace 8 (a very talented gymnast) and Analiese 7 (the period at the end of our family sentence!!!!). Our family gatherings are so full of fun and activity! I agree with the person who said going from none to one was the hardest transition, for me at least. I just had my second (both boys) 3 months ago and with the exception of a few crazy days and crazy moments, it's been relatively easier than when I had my first. Of course mine are 2 months shy of being 4 years apart so that may have something to do with it. The oldest is a big help with bringing me stuff or attempting to entertain the baby when he's fussy and I can't get to him. But don't assume #2 will be easier than #1! That's not always the case, mine are proof of that! I really thought #2 would be laidback in comparison to my fireball #1, but I think I just ended up with two fireballs. When my oldest was 4 months I started watching my 4 year old niece and it was SOOO hard. I was nervous about having a second, my girls are 20 months apart. It's TOTALLY different when they are both yours. You fall into a routine and things just seem to "fit." With my niece I felt like I had to constantly entertain her, but with mine we have our intimate playtime when little sister is napping, we all play together, and sometimes my oldest plays on her own. Mine are 6 months and 2 years old now. I might also add that I am a private voice teacher 2 days a week, and run a small home business of making cards and announcements. I'm BUSY, but I still make time for my husband every night, and my kids during the day. Just like you've been managing on months of not having a full night of sleep, you just keep trucking along. There are days when I am dragging, but the payoff is more worth it than I ever thought possible. The pictures are just precious! I especially like the last one for the colors. I hope you get to feeling better soon. I had my little man back last December and I have been sick 5 times since. I have even taken two rounds of antibiotics. Even though I am still taking my prenatal vitamins (breastfeeding) I still seem to get sick all the time. Just think, I have been sick 5 times out of the 9 months my little guy has been in this great big world. Luckily, he has not been sick until now...he has a horrible cough. Having two isn't that bad you just get into a routine and the craziness becomes your new normal! My oldest is 3 and just started preschool and when hes gone in the morning I just have my 18 month old at home and it seems soooooo relaxed and easy-I forgot how easy and uncomplicated one can be!! Cute pics! I have to say the lack of sleep or rest can really wear you down. Also, when I had my first I got sooo sick sooo often I think cause I was nursing and that in itself on top of lack of rest really did me in. I really think a lot of it was the nursing since it takes so much out of your already worn down body, I had a terrible strain of the flu and an awful case of strep throat that year I nursed him! I am beginning to wean my one year old daughter right now and I have actually been healthier this time around but I haven't been AS tired this time. And by the way I have a boy and a girl and I LOVE IT! Tiring and stressful and times but I couldn't be more blessed to have these two! I have been reading your blog for a while now and LOVE the way you write and Harper is just beautiful. 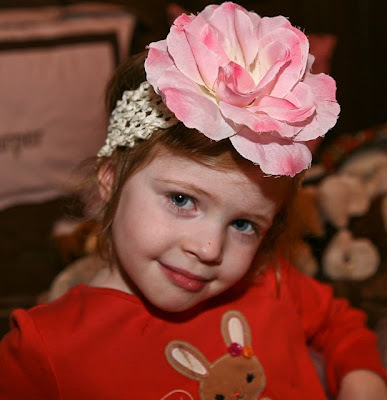 I am completely in love with all of her headbands as well. I am usually a lurker but I just had to make a comment about the crawling before walking topic. As an early childhood educator, the number one factor in kids who receive OT services (Occupational Therapy) are kids who did not crawl before they walked. Babies need to develop those shoulder muscles before they can develop their fine motor (fingers and thumbs for writing, cutting, etc)...so even though she wants to be a big girl....she has got to crawl before she walks! Hi, I usually just lurk around these parts and enjoy the precious pictures of your daughter. You hit a hot topic button for me today in your post that ALWAYS draws me out. As a preschool teacher, I must put my two cents in when people talk about their children "skipping" the crawling thing. Some children DO skip crawling, but one thing to note is, even if they do, you MUST do crawling activities with them. There is a very strong link between children crawling and being able to learn to read. They don't know the exact reason why, but they do know that there is a connection in the brain and the parts that lead to literacy...so, even if she DOES skip the crawling step, please make sure that she crawls...crawling tunnels at the park, crawling under tables, anything like that. Hope that helps you a bit and hope I didn't overstep any boundaries. Harper is such a cutie! I am sure you have people telling you that ALL of the time. I get to babysit our friends 2 year old every few weeks. It definitely is not easy trying to feed 2 and put 2 to bed! But maybe if I had 2 I would think differently. THANK YOU SO MUCH! Wow, Kelly I about passed out when I saw you had commented to my page lol :o). I know how dorky lol, but I know you are so busy with everything and get tons of comments and the fact you took time to comment to me was awesome and I was so happy. Like I have said I love your blog and look foward to reading it daily and use you as a true inspiration on what a Godly women is, your awesome! I am so excited to see the response to my blog so far :o). It was also so neat that your mom posted, how cool! I am really hopeing that the more I blog the more peoeple can see my story and use it as a help to them, but I know God will work it all out :o). I hoping these first couple weeks to give more info on how I lost the 147lbs because just saying people are usually like "huh" lol. Anyways thanks again SO much :o). Hope you have a great day and week! Kelly, My boys were eight years apart, so I had two "only" children. Wish I could have had them closer. But my calendar was always full of big boy stuff and little boy stuff. Now my calendar is empty and I would love to have those crazy days back again. The picture of Emily in her model pose is adorable. What a beauty she is going to be. I know Laurie loved that picture. Glad Emily and Harper had a good day playing together. Have her a brother or a sister or three. HA! After my first I was sick like every 3 weeks. It was so weird. My immune system just flew out the window. Now after little boy #2 I have the immune system of true warrior! It took like a year though. It was a long year as I recall. Hang in there Kelly it's getting better and stronger with every sickness. First I have to tell you, your blog almost always makes me smile. You are just adorble and bubbly! Harper is so beautiful and such a happy little one. I am NeNe to 2 grandbabies, momma to 4 children. No doubt, having more children is not always easy, sometimes difficult, but worth every minute. Tired seems to sometimes be a way of life, but truly the rewards are almost unimaginable. My 3 oldest are adults and spectacular people. My youngest was born with DS, is 15 years old, and God granted our family with the best possible blessing by entrusting him to us. We have such fun together, always know we are there for each other, without question. The love we have for each other is right there to see and feel. While I am still tired, would have nothing different!!!! Walking might be fun, but please make *sure* Miss H gets in *plenty* of time crawling -- the longer you can keep her down 'on all fours,' the better. It's **essential** for solid development of eye-hand coordination! Even if she's one of those ones who 'insists' on walking and takes off like gangbusters, please make *sure* you spend at least an hour every day scooting around on hands and knees to get those neural connections made. And made well. I've two kids - one crawled for 3 months and walk/crawled for another 2 months. The other never did crawl - went straight to walking [and climbing!] Had to do remedial work with the non-crawler for eye-hand coordination. Trust me, it's MUCH easier to crawl/play on-the-floor games with a little one than it is to try and 'retro' the development when the child is older. It's good to have at least two so that after you & your husband are old & gone your children will still have family. I don't know how it is to have 2 because when my daughter was 14 months I had twin daughters.............so I went from 1 to 3!!!! Loved it. Many tea party's & dressing up. I loved it so much I had 2 more..2 boys. Now I am older & my children are adults. I can truly say those were the best years of my life. At the time I really knew how precious those times were & appreciated it to the fullest at the time....for that I am thankful. Tiring??? YEP! Worth it???Absolutely! My 2 prissy girls are the LOVE of my life!!! Watching the love they have for each other is AMAZING!!! I am NOT kidding when I say that sometimes I think 5 is easier than when I had just 1. When I had 1 I worried and fussed over everything. With 5, I just send one in to play with the baby. They fight over who gets to feed him. But I will say homework is harder...I roam from book to page to spelling list, that has increased! sometimes i'm pretty sure it would be easier to raise a pack of wolves than have 3 kids (5, 2, and 9 months) but i wouldn't have it any other way. my first 2 are boys (2 yr 9 mos apart) and are big buddies now. and they adore their baby sister now. i would love one more but my husband says it's too much "like a town". i already feel like a mayor but since he pays all of the bills i won't argue anymore! ha! i think you seem like such a natural, loving mom that you'd be more than fine with another little harper. like people tell me, you make beautiful children, you can't stop here! ha! easy for me to say right?! have a great day! I agree with everyone else! I have 3 kids, and I stay super busy.. but so well worth it.. I am a working mom trying to start a business to stay home so I can enjoy more time with them... but again.. SOOO well worth it.. I LOVE the big flower bands. How super cute are those pics of Harper and Emily! My little one scooted, kinda crawled and then just walked :0)! As far as the immune system goes, you will learn that little ones carry all sorts of germies and when your at play groups, etc. you are bound to pick up something.... The key SANITIZE always! I think it is probably your lack of sleep causing you to get sick more often. And my advice on having a 2nd child. If they are 2 years apart, the first one seems like still a baby when the 2nd is born and tends to be a little "jealous" or whatever you want to call it when the new baby rocks their world. If you have them 3 years apart the first one is such a helper and is old enough to get to do special things without the baby, etc. I did it both ways, 3 years between the first 2 and 2 years between the 2nd and 3rd. It was easier 3 years apart, the only drawback is once the first starts school, it seems like forever (3 years) until the next one can join in. so there are pros and cons to spacing them differently. But they are so worth it...can't imagine them not having siblings. Two kids are exhausting! I have a two year old and 1 month old and it is rough sometimes, but so much fun! It's the not sleeping that kills your immune system. Your body really needs sleep to keep up your defenses. I have to say that often 2 kids are easier than 1 because they entertain each other. When they are really young, I'm sure it is exhausting. However, younger siblings LOVE their older brothers and sisters and are usually captivated by them. My MIL was telling me just this weekend that if you think about it when you go from 1 child to 2 - you DOUBLE the load, but when you go from 2 to 3 - you've only increased your load by 50%. HA! We laughed! I have a girl and a boy. 4 years apart because we were pretty sure that one was for us. God had other plans though. I love have two - it helps you see even more clearly the nuasances of their personalities because mine are SO different. I think it is worth it but those with 3 or more AMAZE me! and yes, your immune system is likely weaker since you're not around people/illness on a daily basis, like when you worked. same thing happened to me. hope you're just tired and not sick! Two is really much much harder! When we only have 1 with us now on certain occasions, I'm like, "wow, it really used to be easy!" It's worth it though when they hug each other. I'm trying to decide if I can deal with a 3rd or not! I have a 2.5 year old little boy, a 8.5 month old little girl and we are expecting #3 in March (I will have 3 under the age of 3 at the age of 24). I always get the question... "Is it hard?". Honestly, I don’t' think so. Sure you don't get very much down time... but I wasn't getting it before my daughter came along anyways. My son wasn't even 2 years old when I had my daughter so I was already running around like a mad woman with him. Adding a second child to the mix only made my life happier and more complete. When I look at the bond my two children have... it just warms my heart. I seriously wouldn't change a thing. Now #3 wasn't exactly planned... my husband and I knew we wanted to have two more kids... we just didn't plan on having another one so quick. My daughter will be 14 months old when our new little one arrives.... and I'm actually very excited for this age gap. My son was 21 months old when my daughter joined us and it was a really smooth and easy transition. I think it will be even easier this time around... b/c now my son and daughter have each other to play with. Honestly I believe every child deserves a sibling... even if it’s just one. I say go for it.. you know you will never regret it and Harper will be an awesome big sister! I think everyone worries about going from one child to two…. but once you hold that second little baby in your arms…. all those worries seem to disappear. My daughter has the same outfit that Harper was wearing today....aren't the colors in it so cute and fallish? I love anything pink for her after having a boy first -- if outfits are offered in multiple colors, i go for the pink!! Anyway, I found the cutest shoes at Children's Place that I bought for one of her church outfits, but they happen to match this outfit perfectly too. Adorable! And yes, I just have to be honest -- two kids completely pushed me over the edge. I like to feel like I am on top of things, and I just don't anymore! They are just under two years apart, I work full-time as a teacher, and life is B-U-S-Y!!! I agree that it is totally worth every second, but girl, it IS crazy! When you have your 2nd or 3rd or 4th...it is truly amazing because God equips you & He gives you the strength & energy where you are lacking...I just look back & marvel at His grace & goodness...but there are still plenty of days that I look like I've been through the ringer when my husband gets home...but that was true when I just had 1, too! They (children) really are a gift from the Lord--hard work, but WELL worth it! Sorry to hear you're not feeling well:( I used to get sick more often, but have started taking something called Juice Plus. It's fruit and vegetable nutrients in a capsule. You should look it up...it's 100% safe and even beneficial during pregnancy and nursing. My 2 year old just started taking it and I've noticed a huge difference:) I'm a distributor, so if you have any questions about it...let me know! Hey girl. I had my daughter last July, and three months later got PNEUMONIA!! Since then (about a year), I have had numerous colds and bronchitis three times! Prior to being pregnant, I never got sick. So, for me, pregnancy totally destroyed my immune system:) Totally worth it though. Girl there is sickness going around that's for sure! I've had a sore and scratchy throat for the last 3 days and everyone at work is out sick too. No fun at all! And as far as cleaning out the closet...it's like a revolving door because it never stops! I just had to do that this weekend in Grace's room! It's crazy, with each season it seems like I'm cleaning out and making room for bigger stuff. :( They grow up too fast! I have two close in age (only 21 months between them) and it is wonderful! They are SO close, love each other immensely and play together all the time! We wouldn't have it any other way. My oldest has always been big enough to help with her little sister which has been a blessing. Harper would love to have a sibling! My immune system stinks since having a child. This year, since he's been in preschool, I've gotten sick every few months! I found that Zicam (or the generic Zinc Cold Remedy) tablets have helped recently. Thought I was coming down with something a few days ago...took that and feeling fine now. Hope you get to feeling better soon. Hope you are feeling better! I know you don't have time to be sick. So I've got two kids -- 18 mos apart. My little girl, Alina, is going to be 3 in December. She was soo hard as a baby but is an angel now that she's older. My son just turned one and he's trouble with a capitol T. We love them so much we're having a 3rd :-) due in April(ish). Anyway, I got to say that extra kids just equal extra fun and joy. Now that my second is getting older, they play together alot and that actually relieves alot of stress on me!! If they are happy playing I can clean or blog or something! It's a wonderful thing, whenever you decide you're ready for it! I don't think a 2nd would be that hard - don't know for sure b/c we had twins and went from 1 to 3! By the time Harper is 2, having a playmate for her would actually make your life easier in a lot of ways. Having more than one child is great. It is so cool to see how different they are even though they came from the same people and do the same things. I have 3 kids 6, 3, and 10 months and they are so much fun. They also have a play buddy so when mom is tired they play together (well, most of the time). I have 3 munchkins and it's WILD, but so wonderful. As tiring and stressful and crazy as life can be right now, it makes me sad to think in a few years they'll all be in school. It's such a gift to be able to be at home and share all their new experiences with them. BTW, I was also never sick before kids, but I catch EVERYTHING now! I have a 4 year old boy and a 22 month old girl. It does get hectic at times with both of them but, I wouldn't change it for the world especially, when I see them playing together and how much they love each other. You will do great as a mom of two whenever or if you decide to go that route just like you are a great mom to Harper. I've only commented one time and so I thought I'd come out and say HELLO. You're an awesome, upbeat mama and such a light in (what can be) a dark world. Keep looking up, Sista! My girls are 22 months apart. So given at first it was exhausting!!!! But it is soooooooo great now. They are 7 and 5 and are best friends!!! Go for it!! Both girls look just precious!! Sorry to hear you aren't feeling well! I wonder if a REALLY good night sleep would help? Sometimes it makes a world of difference for me. Maybe Scott could wake up with her in the night, one night during the weekend? Ps. Adjusting to a second child is NOT easy, but SOOOO worth it! My first 2 were 17 months apart so having 2 just seemed normal since I had only one for such a short time. I can't lie - it wasn't easy & those first few months just getting out of the house with all the crap we needed seemed nearly more effort than it was worth. And then "surprise" one month after my youngest turned 2 I found out I was pregnant again (with little girl #3). And that was the month before I turned 38. I'm 40 now & they are nearly 6, 4 1/2 and 21 months and I wouldn't trade them for anything (well maybe the baby who's started her 2nd Rx for a sinus infection today & has been on the nebulizer for a month already. I might trade her briefly for a solid week of sleep). But I'd sure miss her!! ;)They are exhausting, expensive & infuriating sometimes but totally worth it. It's so worth it. I have two girls (6yrs. & 11mths) I love the gap in their ages it makes things so much easier to me. Part of the reason I so adore reading your blog, is that it reminds me exactly of what it was like when it was just my first daughter and I... I dressed her up super cute every morning and took pictures in every outfit. We went on walks and just cherished every second of everything. It was a really precious time. My second daughter was born when my first was 19 months old (which IMHO was perfect) and it was in-sane for the first few months. Like if we were all dressed, that was good. The laundry got totally out of hand. The house has never really recovered (my house looked all put together like yours - and I chuckle at your picture frames that are below four feet high ha!) But THEN, when the girls got old enough to play together, it actually got easier to have two. They will spend hours now playing together and keeping each other entertained. It's wonderful! And so worth it! You remember when you first saw Harper and couldn't believe how you could instantly love someone SO much? Like the size of your heart just doubled? Well, the first time you see her with her baby brother or sister, it will be like that feeling but twice as much! I just love Harper's pants! One of the girls in my daycare class was wearing those same ones today! And..you think 2 is wearing? Try 10 toddlers(okay, so they're in a space created just for them but still!)! Going from 1 to 2 was very hard for me (they were 20 months apart). Going from 2 to 3 was nothing (23 months apart)...and after 3, you just might as well have more! Seriously though, once you've got more than 2 running around, you'll wonder what you did with all of your time! Harper is beautiful! Sometimes I miss the time that I had when it was just my oldest...time goes by so fast (she's almost 8). Enjoy every single second! I was sick quite a bit the first year after having a baby too. I think it was my immune system being weekend from giving birth or something. kelly, i have a 20 month old son and i had 4 sinus infections this summer alone... finally went to my allergist... he told me that your immune system is suppressed for up to 3 years after you get pregnant... its how your body "hosts" the pregnancy... the baby (since she is 1/2 your hubby) is a foreign object so your defenses must be lowered. i had never heard that before... he is amazing MD who is always producing research and teaches at the med school here in memphis... just thought i'd share! so YES, your immune system is shot from having a baby!